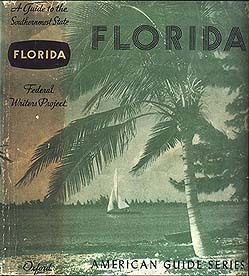 This section should introduce you to the history of the Federal Writers' Project, nationally and in Florida specifically, and raise some theoretical and methodological concerns about the image of Florida that emerges from the FWP state guide. The FWP, a New Deal creation, was born out of the need for job opportunities for unemployed writers. Looking for a project of a national scale, the architects of the FWP ultimately conceived of the plan for a series of tour guides to the States. This project, they imagined, would engage the talents of various kinds of white-collar relief: researchers, historians, journalists, archeologists, geographers, and anthropologists, to name a few. The Federal Writers' Project would produce a new kind of tour guide: collectively written, democratic in both subject matter and method, a "public Baedeker." The guidebooks turned out to be, it follows, an imaginative blend of genres; part travel literature, part ethnography, part local history... which makes the task of unpacking them a necessarily interdisciplinary one. I've tried to interpret the Florida edition, Florida: A Guide to the Southernmost State, through various frameworks. In particular, I've read it in light of one specific tradition: that of local color writing. I think that treating the guide as local color enables some productive and relevant readings. Traditionally, you would move first to a background history before delving into more specific, closer readings...and there's good reason for that approach. I'm hoping that you wouldn't be too disoriented if you chose to start off, instead, with either some reflections on the theoretical and methodological implications of the tour guide genre, or an introduction to what I'm calling the local color voice, which you'll recognize as it pops up in the guidebook and other sources from the period.